East Lake Golf Club’s Clubhouse & 6th green on front side. Greetings from Atlanta! Part of GameBook’s team is here to provide our Live Scoring system for different tournaments. Last Tuesday we had honor to provide scoring for Georgia Tech College’s fundraising tournament called Rambling Wreck Cup at the Golf Club of Georgia. See photos from that day! That was my first visit at that course. The Cup was played at Club’s Lakeside course, which was one of the most beautiful courses I’ve seen for a while. Lake scenery, spectacular views and a nice lay out. There were a lot of former and current Georgia Tech’s players playing and enjoying a nice day. Few to mention: Open Champion Stuart Cink, PGA Tour Player Bryce Molder, Masters Champion Larry Mize, Golf Channel Analyst, former PGA Tour player Charlie Rymer. Great day and fundraised money for a good cause! East Lake Golf Club, 15th hole. Our great app got only very positive feedback from the players. Tech’s College players were thrilled when they realized it’s actually free and they are able to use it when and where ever. After the using experience you always realize a lot easier how cool and easy to use Golf GameBook is. I’m not saying this just as a marketing jargon. Even I’m working for GameBook nowadays I still remember very well my first experiences in 2009. I was hooked right after my first try. After a long but successful day we got a great opportunity to play at East Lake Golf Club, which all of us knows as a stage of PGA Tour’s FedEx Cup final tournament, Tour Championship. The day was perfect if you do not take into account the rental clubs I got. Thanks to Rantsu for letting me borrow his driver on every hole after the last five-six holes with my garden-hose-flex rental driver. I wouldn’t have hitted even the airport’s landing strip with it. 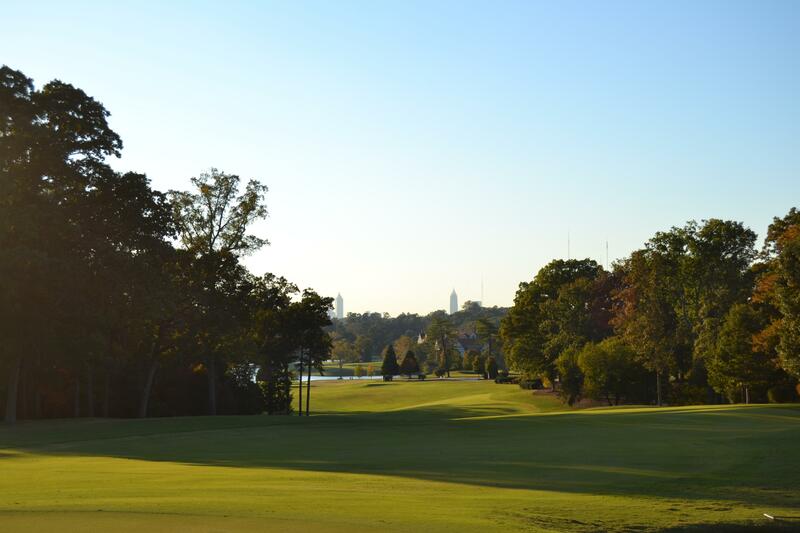 Course was played in a perfect condition, thanks to Tour Championship aftermath. Fairways were whole smooth green carpet from tee to green, greens were as slippery as the glass table and the weather was sunny +23 degrees with only a light wind. I could not ask for anything more. Bo getting up from the greenside bunker on 5th hole. I’ve got chances to play many great courses around the world and very grateful for that. Yesterday led me to think what really makes difference between these courses. You know, matters of taste there’s no meaning to argue. History has a major impact! It’s always more special to play the hole you saw on TV couple of weeks ago, dismounth to excat the spot from where Bill Haas shot his amazing recovery shot two years ago and won the Tour Championship & FedEx Cup and walk to the tee knowing Tiger Woods was here a month ago as well. Can I hit my ball as far as Tiger did, oh yeah, Sergio made the birdie from there, there was a leaderboard screen and so on. We know how big college sports is in the U.S. Rantsu has told me many great stories last days of his time in Georgia Tech in the mid 90’s. I have got a picture not only for its excellent sports events but the team spirit, pure atmosphere and pure sport. I guess that’s so, then that money brings too much dirt in its side to sports too. Sport is the purest form, when the money does not yet constitute the main reason. Rantsu ripped his drive on 15th hole at East Lake Golf Club. Georgia Tech Men’s Golf Team played in Rumbling Wreck Cup as well like I told earlier. Damn those boys are hitting their ball long and straight! We are going to see those guys again today. The USCC College Golf Tournament will be played from Friday to Sunday and GameBook has the honor to provide tournament’s Live Scoring again. We are looking forward this great event, which is very well organized by Georgia Tech. 11 great teams, UCLA is a defending champion from last year. College golf world is fascinating and I am convinced that the future of the top players are grown in just this way.